Since the Alaskan Way Viaduct closed, riders on the West Seattle Water Taxi have more than doubled. King County Metro is hoping that some of those new riders will keep using the water taxi even after the tunnel replacing the viaduct opens. 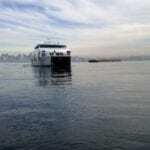 On this week’s Unmute the Commute, we take a trip to Elliott Bay and hear from people commuting by boat. Produced by Jennie Cecil Moore. Unmute the Commute is supported in part by Just One Trip — a King County Metro initiative to get you out of your car starting with just one trip.